This hair butter comes in a dark, square and also elegant container, decorated with a label. The packaging is aesthetic and original. Saryna Key butter has a nice, sweet scent. The product is efficient and available in two versions: one with the capacity of 500 ml and the second one 300 ml. The components are based on African shea butter but enriched with a range of ingredients that are able to increase the volume of even extremely thin hair. 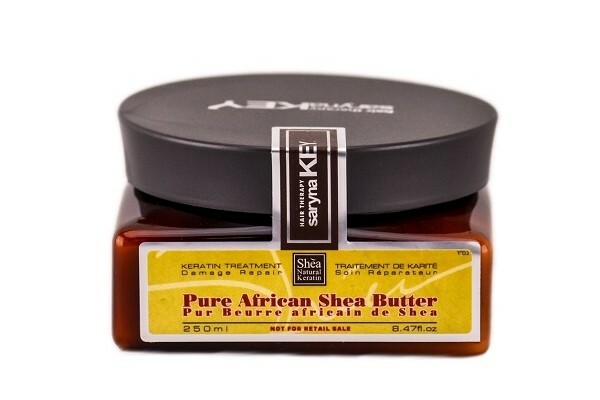 Shea butter – smooths, provides resilience, maintains proper level of hydration (of hair), strengthens hair bulbs, ensures shine and protects strands from damages. wheat protein – is responsible for nourishing hair. It regenerates it by strengthening hair bulbs. This way, strands are not brittling and do not loose water which means that they are not dehydrated. Also, hair resilience and vitality is improved. Keratin – is the main building block of hair. It is responsible for maintaining good hair condition, and improving its resistance to adverse external factors. Therefore, high or low temperatures are not a threat to your wisps. Saryna Damage Repair Key Pure African Shea Butter is a product that is not only intended for healthy high porosity hair. Due to the high content of keratin, it can weigh low porosity hair down a bit and make it stiff. For this reason, women with thin, medium porosity hair will be more fong of the product from Saryna Key. Ladies with thick and heavy strands can reach for the butter from Saryna Key at a time when humidity is increasing – this way they will protect their wisps from frizz or curling in all directions. Butter disciplines unruly strands. Saryna Damage Repair Key Pure African Shea Butter ought to be applied to clean, towel-dried hair. Leave the product in for about 5 minutes. Then, rinse your wisps thoroughly. Saryna Damage Repair Key Pure African Shea Butter – despite the high content of shea butter, it is suitable for low porosity hair as well. On the other hand, keratin contained in the product can weigh it down. Therefore, women with medium porosity hair can or even should use it with caution. Too much of the cosmetic can cause unwanted frizz. Hair butters – cover your hair with beauty! How should you use hair butter? Shea vs. coconut – Which butter for your hair? Low porosity hair butters Copyright © 2019.